The Norah Sande Award, an international piano competition held annually in Eastbourne was won this month by Dinara Klinton on her 24th birthday. Born in the Ukraine, Dinara has recently completed, with distinction, her Masters degree in performace at London’s Royal College of Music where she studies with Dina Prakhina and is a ABRSM scholar. Dinara received a cheque for £3000 and the opportunity to perform in a recital later in the year. The final stages were held in the purpose-built concert hall at the Birley Centre, Eastbourne College. 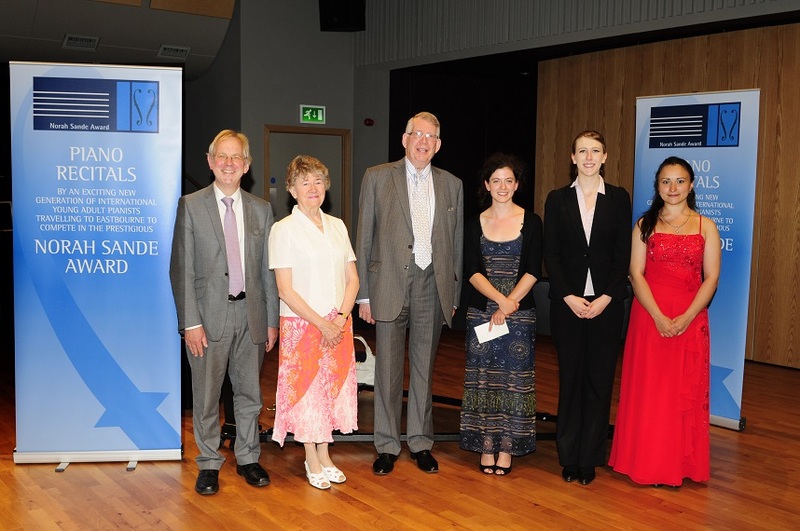 Fourteen semi-finalists performed a 20 minute programme on Saturday 5thth July before a prestigious adjudication panel, Timothy Barrratt, Ruth Gerald and David Patrick (Chairman) – all keyboard exponents of international repute. Three were chosen to perform a full recital programme incorporating classical, romantic and contemporary pieces the following day. Before moving to England to study at the RCM, Dinara graduated with honours from the Moscow State Conservatory where she studied with Eliso Viraladze having previously studied at the Central Music School, Moscow with Valery Pyasetsky. She won her first international competition at only eight years old, the Usty-nad-Laba in the Czech Republic. Since then Dinara has been successful in numerous competitions including first prize at the Sheepdrove Competition in the UK, second prize for the Ferrucio Busoni International Piano Competition, Grand Prix for the Berne Interlaken Classics International Piano Competition and the Vladimir Krainev International Competition for Young Pianists, First Prize for the International Seiler Piano Competition, Second Prize for Tchaikovsky International Competition for young musicians. She also received the Diploma of Outstanding Merit at the Hamamatsu International Piano Competition. Festival appearances have included the Rheingau Music Festival, RavelloFfestival and the International Festival of Piano "La Roque d’Antheron”. Dinara has given solo recitals across the world including Moscow’s Great Hall and Tchaikovsky Concert Hall, the Gewandhauss in Leipzig and the South Bank Centre and in Italy, France, Switzerland, Japan, Malaysia and the USA. She has also worked with orchestras, such as Musica Viva with Alexander Rudin, Orchestra del Roma e del Lazio with Moshe Atzmon, and The Moscow Virtuosi with Vladimir Spivakov. She made her debut recording at the age of sixteen, with Delos Records, and the album Music of Chopin and Liszt. Dinara Klinton performed Scarlatti Sonatas K466 and K455 and Chopin’s Etudes Opus 25 No 10,11 and 12 in the second round and in her final performance she played Beethoven’s Sonata Opus 78, Prokoviev’s Sarcasms Opus 17, Liszt’s Transcendental Etude No 5 and Gounod/Liszt’s Waltz from "Faust”. Hannah Watson was named as runner up and received a cheque for £1000. Hannah is currently studying at the Guildhall School of Music and Drama with Caroline Palmer and Martin Roscoe. In 2013 she completed her M.Mus year with distinction. She studied at Cambridge University with Thalia Myers from 2008 – 2012 and had previously attended the Royal College of Music Junior Department from 2004, gaining an ABRSM Diploma with distinction. Cambridge provided her with a wealth of very different musical opportunities from solo and concerto playing in West Road Concert Hall to song and chamber recitals in Kettles Yard and a tour with the CU Chamber Orchestra. Highlights of the Guildhall course have included Chabrier’s piano pieces at the Barbican, a concerto performance with the Guildford Symphony Orchestra and a song recital at St Martin in the Fields. Hannah Watson performed Janacek’s Sonata "From the Street” 1st movement, Schubert’s Hungarian Melody D817 and Debussy’s L’Isle Joyeuse in the second round and in the final round she played Bach’s Prelude and Fugue in C Sharp minor and major, Sibelius’ Six Finnish Folksongs and Messiaen’s Regard de l’Eglise d’Amour. Third place and a cheque for £500 was awarded to Madelaine Jones who is currently studying at Trinity Laban Conservatoire of Music and Dance, studying piano and improvisation with Penelope Roskill and Douglas Finch respectively. She is a previous winner of the John Halford Piano Competition, the Gladys Puttick extemporization Competition and the Medway Young Musicians Award. Her choral accompaniment experience has included working alongside the BBC Singers. Madelaine has a particular interest in early keyboard music and instructions, previously studying harpsichord with James Johnstone on an Early Music Scholarship at Trinity Laban. She has performed as a harpsichordist and chamber organist wit the Trinity Laban Baroque Orchestra and Vocal Ensemble in the Greenwich Early Music Festival. Madelaine Jones played Gubaidulina’s Chaconne and Farrenc’s Air Russe Varie in the second round and in the final she performed Bach’s Prelude and Fugue in D minor, Stravinsky’s Sonata (1924), Farrenc’s Etude in F sharp minor Opus 26 No 10, Bach’s Partita in A minor and Stravinsky’s Tango. "The Norah Sande Award continues to interest the very top young pianists on the cusp of an international performing career. Applications were high in both quantity and quality which enabled us to put on an outstanding Second Round and Final, enjoyed by the audience now loyal to the annual Award” said Spencer Freeman, the Award’s Artistic Director. "The Birley Centre is proving to be one of the finest new concert halls in the region and we are looking forward to hosting our tenth Award finals there next year.” Details of the 2015 Award and entry form are available on www.sande-award.co.uk. This Award has been enabled by a substantial bequest from the late Norah Sande, in memory of her Grandmother, Alice Mary Caffen. The Norah Sande Award is a charity administered by the Trustees of the Eastbourne Music and Arts Festival. Each year young adult pianists are invited to enter the Norah Sande Award, held at the Eastbourne College Birley Centre, and the Saturday heats are open to listeners without charge. On the Sunday the chosen three finalists each perform a programme of their own choice on the Centre’s fine Steinway. The artistic director Spencer Freeman presided; and adjudicators Ruth Gerald, Timothy Barrett and David Patrick were on the balcony, pens poised. We heard first a programme of Bach, Stravinsky and Farrenc (presumably Louise, a French pianist, teacher and composer, 1804-75). Madelaine Jones plays both harpsichord and piano, and her remarkable finger-dexterity no doubt owed much to her familiarity with the former instrument. Her inclusion of a work by a woman composer (assuming I’m right in my presumption) was a nice touch, and it was good to be introduced to Farrenc’s Chopinesque F Sharp Minor Study. Dinara Klinton was born in Ukraine, and has studied not only in Moscow but at London’s Royal College. She played one of Beethoven’s less-well-known Sonatas, his Opus 78, and three unashamed "display” items: Sarcasms by Prokofiev, and two works by Liszt: a Transcendental Study, and his astonishing transcription of the Waltz from Gounod’s Faust. Hannah Watson added an extra dimension to her recital. Having delivered fine performances of two Bach Preludes and Fugues, she stood to speak to the audience, making excellent contact as she introduced not only some simple pieces by Sibelius, but in addition Messiaen’s Regard de l’Eglise d’Amour, a work that seemed to set the entire building vibrating to its oft-repeated fortissimo chords. The chairman of the judges, David Patrick, announced that Dinara was the unanimous winner, with Hannah the runner-up. The winner will give a recital early next year. As usual, the Sande Award had presented three outstanding talents for our delectation.